Australian scientists are discovering new Species every day. It certainly seems this way. Spiders are on the new knowledge table at the moment. Many have been unknowingly in the Queensland museum for a very long time. 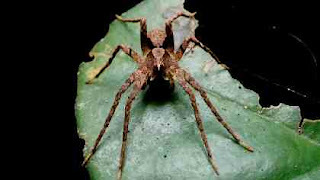 The new arachnids are in the Dendrolycosa, Dolomedes, Ornodolomedes, Megadolomedes and Mangromedes genera. They are all spiders of the water. New ones in the Ornodolmedes category are the most beautiful of all. Striking patterns and colors abound. Naming of recent additions have taken a turn as well. They carry the names of celebrities such Mick Fanning, Jack Nicholson and Professor Brian Greene. Soon there will be Blondie, Boy George or perhaps Kiss. Jokes aside, This is an interesting field. Why are there so many spiders that hunt on the surface of water? Other names for them are raft, fishing, wharf, also dock spiders. Some have a diving bell to trap air for breathing while under water.